Antoine was born in 1684 in the town of Valenciennes. Valenciennes was part of the Spanish Netherlands. Two sources disagree as to when the town came under French rule but Antoine's early influences in the art world were decidedly Dutch. His father, Jean Phillippe, was a hard working tiler and his mother Michele Lardenoire was a simple working woman. At the age of six, Antoine's father found him with the family's copy of the Lives of the Saints. The lad had covered the margins of the pages with drawings and designs in colors. It was Antoine's schoolmaster who persuaded Jean Phillippe to allow the child to receive proper drawing instruction. Antoine was a “feeble child” with a “weak and delicate constitution.” His father felt that allowing him to pursue a career in the arts would carry less risk of Antoine falling off of a roof and breaking his neck. The name of his first teacher is lost to history, one account saying that he did little to influence Antoine's art. Valenciennes was a fairly large city with fine churches full of inspiration and a number of art societies and guilds. Jacques Albert Gerin was the master of the Guild of St. Luke and a friend of Jean Phillippe. In 1698, Antoine was apprenticed to Gerin for a term of 3 years. Paintings by Rubens, Van Dyck, De Vos, Jordaens, Coques, Terniers and other Flemish masters could be found in area churches and provided inspiration for the young student. He finished his first piece in 1700 and while a copy of a work by Teniers, Watteau's fine detailing of the clothes on the figures was completely different than the Dutch style of painting. In 1701 Gerin died. He had often spoken to Watteau of Paris and urged him to go there to study the work of other great masters. Without the support of his family, Watteau left for Paris. In those first years in Paris, Watteau worked for a decorative artist who dealt in “cheap and crude works” for $3 a month and a daily plate of soup. 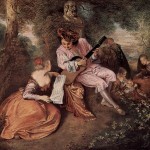 Seeing the talent possessed by Watteau, his wage was increased to $20 a month. Spoede, pupil at the Royal Academy and winner of the Grand Prix became a friend and introduced Watteau to his next teacher – Claude Gillot. 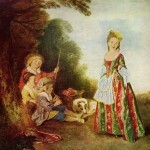 By 1705, Watteau was working for Gillot. Gillot was a painter of grotesques and theatrical scenes. Watteau flourished under Gillot and began to shift from Watteau the Fleming into Antoine Watteau the exquisite French artist who made a new genre in art – fetes galantes: scenes of bucolic and idyllic charm, suffused with an air of theatricality. Many of his works were drawn from the world of Italian comedy and ballet. 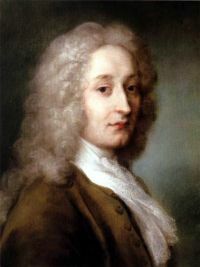 Watteau would become a student of Claude Audrin in 1708 and work with Monsieur de Julienne (director of the Gobelins Tapestry Manufactory) in 1710. Julienne introduced Watteau to Crozat, one of the great art collectors of the time, and was given both commissions and free access to a collection of 1,900 drawings and 400 paintings by artists such as Rubens, Titian, Van Dyck and Veronese. Throughout much of his life, Watteau lived with his teachers and patrons. His health, while never robust, began failing and his friends urged Watteau to travel to England to seek the advice of Dr. Meade, a well-known specialist. Under the doctor's care he painted several pieces and was commissioned by the King to paint six pictures. The climate aggravated his condition and Watteau returned to France. Edme-Francois Gersaint welcomed the ailing Watteau into his home. Gersaint was a central figure in the development of the art market and luxury trades in the early 1700s. Watteau painted the merchant's famous sign in 1720. In 1721, Watteau had hoped to return to his native Valenciennes to visit his parents. His doctor forbade the trip and his friend Canon Haranger provided a house in the quiet country village of Nogent-sur-Marne. Surrounded by friends and pupils, Watteau died in the arms of his dear friend, Gersaint in 1721. This famous portrait of Antoine Watteau was painted by Rosalba Carriera (1675-1757) in 1721.